Friend or foe? A California two-spot octopus (Octopus bimaculoides) gives observers the eye at the Marine Biological Laboratory in Woods Hole, Mass. Octopuses are almost entirely antisocial, except when they're mating, and scientists who study them have to house them separately so they don't kill or eat each other. However, octopuses given the drug known as MDMA (or ecstasy, E, Molly or a number of other slang terms) wanted to spend more time close to other octopuses and even hugged them. "I was absolutely shocked that it had this effect," says Judit Pungor, a neuroscientist at the University of Oregon who studies octopuses but wasn't part of the research team. The eight-legged invertebrates are separated from humans by more than 500 million years of evolution, Pungor says. Octopuses' closest relatives are creatures like snails and slugs, and their brains have a host of strange structures that evolved on a completely different trajectory from the human path. "They have this huge complex brain that they've built, that has absolutely no business acting like ours does — but here they show that it does," says Pungor. "The fact that they induced this very sort of gentle, cuddly behavior is really pretty fascinating." The idea to test the drug's effect in octopuses came from Gul Dolen, a neuroscientist at Johns Hopkins University. "My lab has been studying MDMA for a long time, she says, "and we have worked out a lot of neural mechanisms that enable MDMA to have these really, really profound pro-social effects." Dolen got interested in octopuses a few years ago, when scientists sequenced the full genetic code of a creature known as the California two-spot octopus. It turns out that octopuses and people have almost identical genes for a protein that binds the signaling molecule serotonin to brain cells. This protein is also the target of MDMA, so Dolen wondered how the drug would affect this usually unfriendly animal. "Just because they have the protein," she says, "doesn't mean that when MDMA binds to the protein it's going to do anything like what it does in a human or a mouse." To find out, she and Eric Edsinger, a colleague working at the Marine Biological Laboratory in Woods Hole, Mass., first had to figure out how to give octopuses ecstasy. They put the hand-sized creatures in a beaker filled with seawater and MDMA, so the octopuses could absorb the drug through their gills. The researchers started out with high doses of the drug, just to see if it had any effect on octopuses at all. "They really didn't like it. They looked like they were freaked out," says Dolen. "They were just taking these postures of super hypervigilance. They would sit in the corner of the tank and stare at everything." But lower doses — the sort a person might take — produced a profound change in behavior. The researchers knew from previous tests that an octopus would normally stay far, far away from a second octopus that was confined to a small cage inside the first one's tank. But an octopus on MDMA would get up-close and personal with the new neighbor. "They spent significantly more time in the side of the tank, the chamber, that had the other octopus in it," says Dolen. What's more, without the drug, any octopus that approached the stranger at all would remain very reserved, perhaps only reaching out one arm to tentatively touch the other animal's cage. "After MDMA, they were essentially hugging," says Dolen, who explains that the octopuses were "really just much more relaxed in posture, and using a lot more of their body to interact with the other octopus." To her, the results published in the journal Current Biology show that "serotonin has been encoding social functions for a very, very long time. At least 500 million years ago, it started doing this function." Zachary Mainen, a neuroscientist at the Champalimaud Centre for the Unknown in Portugal, points out that some research done decades ago showed that giving extra serotonin to lobsters can alter their social behavior. "Specifically," Mainen explains, "if you give them more serotonin, they become more dominant. A small lobster given serotonin will become a more aggressive, socially dominant lobster." He says MDMA, which affects the serotonin system, clearly affects the octopuses' social behavior, but it's not clear to him if it's really inducing greater love for another creature. "Is it really affection? How would we know?" Mainen asks. "It's totally fascinating and super-suggestive, but I am not a hundred percent convinced that this is doing the same thing in octopus and in human." Still, he thinks it's amazing that this drug has somewhat similar behavioral effects. "I like the fact that they've shown that a species so alien to us as an octopus has a molecule, a serotonin transporter, which can be affected by a drug which affects us, and that the drug has a somewhat similar effect on the octopus," Mainen says. "It just shows us how much we don't know and how much there is out there to understand." The mood-altering drug known as ecstasy can make people feel more loving toward others, and researchers now say it has a similar effect on octopuses. NPR's Nell Greenfieldboyce has been diving into this important story. NELL GREENFIELDBOYCE, BYLINE: Octopuses are bizarre, almost like aliens. They're related to slugs but have a huge, complex brain that looks nothing like ours. And except when mating, they are notably unfriendly to other octopuses. GUL DOLEN: Of the 300 or so estimated species of octopus, there's maybe one or two that are social, and all the rest are asocial. GREENFIELDBOYCE: Gul Dolen is a neuroscientist at Johns Hopkins University who's studied the drug ecstasy or MDMA. 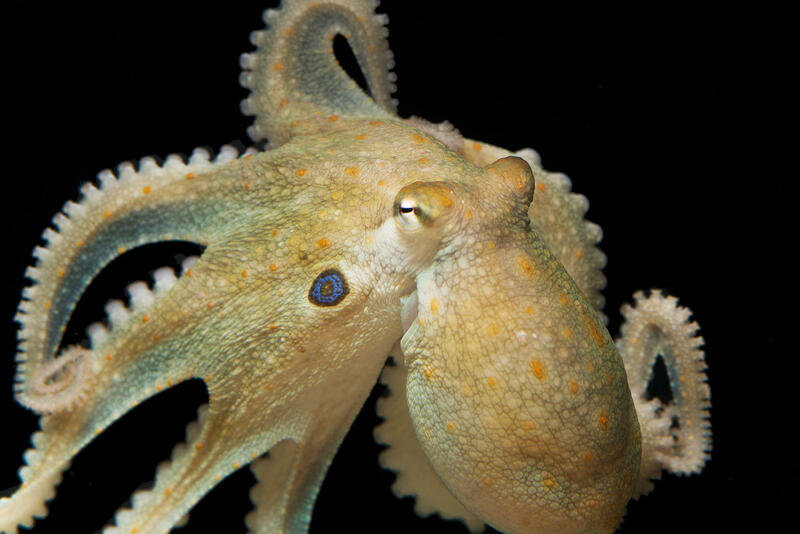 It targets a brain protein that seems to be almost identical in humans and in octopuses. So she and a colleague named Eric Edsinger gave the drug to octopuses to see if it would make the animals more social. DOLEN: And what we did is we put that MDMA in a beaker that had a known volume of seawater in it. And then we put the octopus inside of that beaker and just let it sit there for 10 minutes. GREENFIELDBOYCE: Then they put the octopus into a tank. Also in that tank was another octopus that was confined to a cage - well, really an upside-down flower pot with holes in it. Octopuses would ordinarily stay far away from the imprisoned stranger, but not so on ecstasy. DOLEN: First of all, they spent significantly more time in the side of the tank, the chamber, that had the other octopus in it. GREENFIELDBOYCE: Without the drug, octopuses acted reserved and aloof and might only reach out one of their eight arms to touch the cooped up animal. DOLEN: Whereas after MDMA, they were essentially hugging the flower pot that had the other octopus in it. JUDIT PUNGOR: That has absolutely no business acting like ours does, but here they show that it does. GREENFIELDBOYCE: At least, it seems to. Zachary Mainen is a neuroscientist at the Champalimaud Center for the Unknown in Portugal. ZACHARY MAINEN: Is it really affection? How would we know? So it's really - it's totally fascinating. GREENFIELDBOYCE: And it shows that some of our biological systems for social behavior must go way, way back because humans and octopuses are separated by more than 500 million years of evolution. (SOUNDBITE OF KLIMEKS' "TRANSCEND") Transcript provided by NPR, Copyright NPR.